In occasione del 23° anniversario il Nidaba Theatre presenta un evento davvero speciale Eric B. Turner, non ci sono parole per descrivere questo grandissimo cantante gospel newyorkese, direttore del gruppo Gospel “The Harlem Voices” che sarà accompagnato dalla band Toscana capitanata da Paolo Pee Wee Durante all’Hammond, Danny Bronzini alla chitarra, Dimitri Espinoza al sax, e Piero Perelli alla batteria. Un tuffo dal blues alla Motown, dal Funk a sonorità più Gospel in uno spettacolo capace di accendere tutti i tipi di emozioni umane. 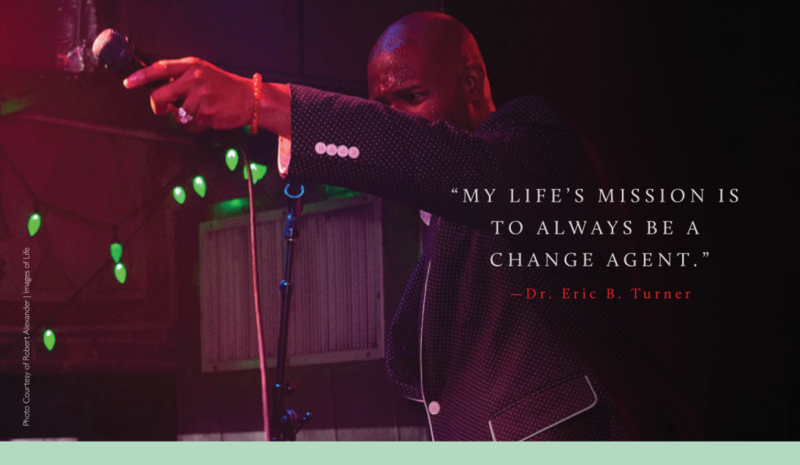 Psychologist, Professor, Singer, Composer, Lyricist; Any one of these titles would be enough to fill a life’s worth of work, but for Eric B. Turner these titles are one and the same. Gifted with the ability to flow effortlessly from one mantle to another, Eric B. Turner is the very definition of a Renaissance Man. Born and raised in Cleveland, Ohio, Eric began exploring his talents while being involved in his church. Directing the choir and singing at his church from the age of seven years old, Eric showed early on that he had that “IT FACTOR” and an aptitude to understand and translate musical movements. A gift that would serve him well in the years to come.